For more than a hundred years, Lild Strand has been a well-functioning fishing community, and today the cuttings are still drawn on the beach. The place is surrounded by a large, open and protected landscape with dunes, heaths, woods and lakes. Lild Klitplantage stretches along the coast behind the dunes and is characterized by heather, meadow, coniferous trees, small lakes with pipe forest and idyllic hiking and cycling trails. 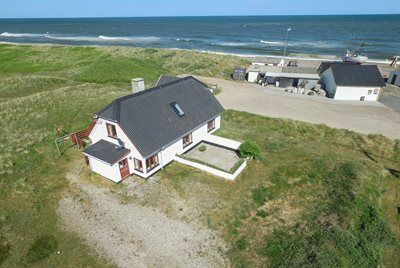 Lild Strand is ideal for those seeking tranquility, cozy, beautiful and unspoiled nature, good beach, rich birdlife and wildlife as well as plenty of fresh air at the North Sea. The house is directly adjacent to a public car parking place. Holiday home suitable for 8 persons as well as 1 child up to 3 years. The holiday home is 152 m², in 2 levels, and is build in 1927. In 1995 the holiday home was partial renovated. You can bring along 1 pet.The holiday home is equipped with 1 energy-saving heat pump. The holiday home has washing machine. Tumble dryer. Freezer with a capacity of 40 litres. Further more there is 1 wood-burning stove. For the youngest ones there is 1 high chair. The holiday home is situated on a 199 m² natural site. Situated 50 m from the sea. Nearest shop is 7000 m away. You find a tool shed. Swing. Sandbox. Parking place by the holiday home.